One of my greatest goals was to be the responsible for originating a true community of professionals in the Internet Marketing area. Some of the biggest instruments for that community are, undoubtedly, the live events. It is where we can meet the people with the greatest success in this community, where we can exchange experiences and where a simple bar conversation can give us a very valuable suggestion. We can strengthen friendship and cooperation bonds that can last for several years. That is where partnerships and super productive associations take place. It is on the events we realize this professional activity is structured by people who know what they are doing. It is on the live events, we realize that this community is something really special, different from everything you have ever seen or felt. I didn’t want this community to be just another one. I wanted it to create an environment any person would feel at home, in a safe and honest place. The same environment we feel when we get home, in our parents’ or our grandparent’s house, where people want us well, protect us and teach us. Bottom line, where people love us. I wanted not only to create that trust feeling, but also a professional environment, a community with the best of the best. A community with a true cooperation, where nobody hides information from each other, a community oriented so everyone gives and receives the best from others. Where there is a great will to help others and, as such, where you receive like in no other place. A community we’re proud to be part of. This community is an unstoppable movement. Today it is not only multinational, but also multilingual. 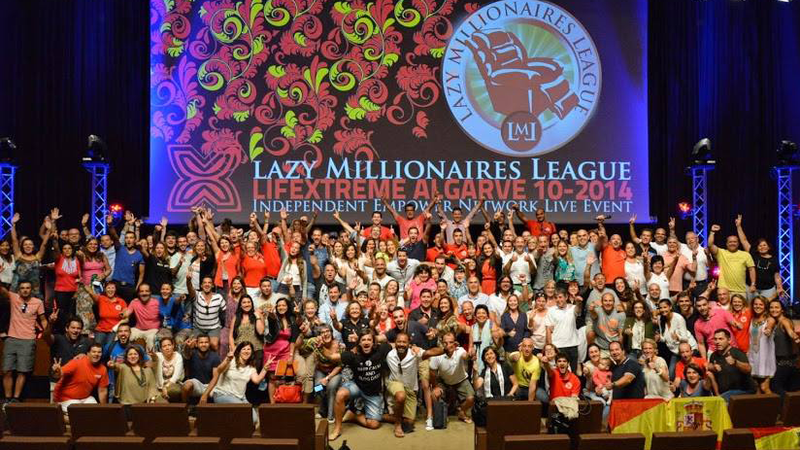 From the initial project of creating a community of Portuguese-speaking Internet Marketers, it was born the same for the Spanish-speaking. With this, the movement became much bigger than what I dreamed of. It is one of those times reality goes beyond the dream! A community directed not only to give you every tool you need to be successful, but also directed to give you the tools you need to give something back too. In the event we’re going to have fun, to learn, to laugh, to cry and to change our life. There will be incredible moments. – to encourage the blood donation and the registration on the Portuguese National Marrow Donor Program. On the 28th of March there will be a unity of the Portuguese Blood Institute. We’re going to change our lives because these events truly change you. Jim Rohn is one of my mentors, and he’s someone that I met several years ago and whom I had the privilege of listening live for several times all over the world (he is no longer within us and I really miss him). And the better way for us to change is by the books we read and by the people around us. An event is the most powerful and intense way for that change to happen. We must not be afraid to change, only trees don’t do it. We can’t take the next step in our life with the same mindset that got us where we are. I see too many people with a bad financial situation, not enjoying the lifestyle they have, doing a great effort for things to change but they simply don’t. And those people simply don’t understand why. If we consider why that is, one of the greatest reasons is the way they deal with challenges, how they deal with the day-to-day circumstances. They want to change their situation without realizing what they have to change first is the way they do things. They’ve to change their attitude. The education and the environment that’s usually around us are not what teach us success. I can easily tell what you earn per year. I just need to know your five best friends, the five friends around you every day. I combine what they earn, divide by 5, and I know more or less what you earn. That means, for you to make more you have to be surrounded by people who do it too, it’s simple! I’m not saying to stop talking to your best friends, not at all. But you have ALSO to start dealingwith people who have the lifestyle you want, that earn what you want to earn. To participate in this event is the best opportunity you have to, deliberately, choose the people you want to be influenced by. After that, you will be forwarded step by step.